Hi everyone a really grotty day here in Aberdeen (if you're reading Suze while toasting in Malaysia- lucky you! )so spent most of the day making this card what a faff though, I'd either get the words right or the heart not both together and I still haven't! This week at Less is More the card is a one layer with hearts as the theme. The colour is rich razzleberry, love this colour because it looks good dark or light and the images are fast becoming a favourite too bought them at half price and one of my best buys! Added some gems to finish off and think it would suit friends that will soon be celebrating their ruby wedding. That heart stamp is fabuloso... love the little flourishes just sprouting from it. Hola Jenni, what beautiful stamp!! and the color is fantastic, so elegant, wonderful sentiment,beautiful rubi card, well done. Very pretty, and a lovely sentiment too. This is stunning. I think OL cards either work first time or one can spend HOURS messing up perfectly good cards trying to get it right lol! Devine, great sentiment as well. Very elegant, great stamp, wonderful sentiment. I love your card, and Rich Razzleberry is perfect for it. The hearts are wonderful and the bejewelled flowers set it off perfectly! Your card is lovely. Gorgeous stamp and a super colour. I love that sentiment. What a gorgeous card love the image and the wording too! Big warm welcome to blogland too - WARNING: its very addictive (but I guess you already know that!). Great card, worth the faff! 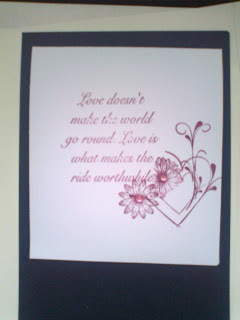 Love, love love the quote....a very pretty card!